Two destructive powerhouses of Attack on Titan, Eren’s Titan form and the Female Titan will both be present in the upcoming game from Omega Force and Koei Tecmo. Following two games on the 3DS, mobile titles and an addictive fan-made multiplayer game on PC, console gamers are finally getting a story-driven Attack on Titan game exclusively for the Sony consoles. 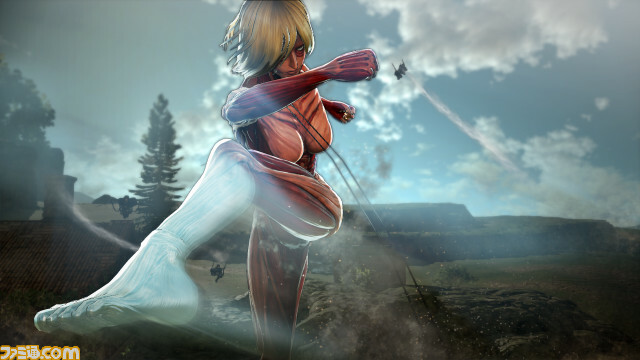 From Koei Tecmo and developer Omega Force, Attack on Titan will arrive in early 2016 with massive open-world environments and gameplay that focuses heavily on taking down the massive giants upon mastering the Maneuver Gear. At various points in the game, players can also recruit iconic characters from the Attack on Titan universe to serve as party members during select missions. Attack on Titan will release for PS4, PS3 and PS Vita on 2/18 in Japan; North American versions have also been confirmed, and are expected to arrive sometime in 2016.